In Joe Speedboat the inhabitants of a sleepy rural town are shaken awake by the arrival of a kinetic young visionary—the eponymous Joe. After a violent farming accident plunges him into a coma for six months, young Frankie Hermans wakes up to discover that he’s paralyzed and mute. Bound to a wheelchair, Frankie struggles to adjust to a life where he must rely on family and friends to complete even the simplest tasks. The only body part he can control is his right arm, which he uses obsessively to record all the details of daily life in his town. But when he meets Joe Speedboat—a boy who blazed into town like a meteor while Frankie slept—everything changes. Joe is a centrifugal force with the touch of a magician and the spirit of a daredevil, and he alone sees the potential strength in Frankie’s handicaps. With Joe’s help, Frankie’s good arm will be used for more that just writing: as a champion arm-wrestler, Frankie will be powerful enough to win back his friends, and maybe even woo P. J., the corkscrew-haired girl who has them all in a tailspin. Alive and exuberant with the profundities of adolescence, Tommy Wieringa’s Joe Speedboat is the supersonic story of an unlikely alliance and a lightning-quick dash to grow up. 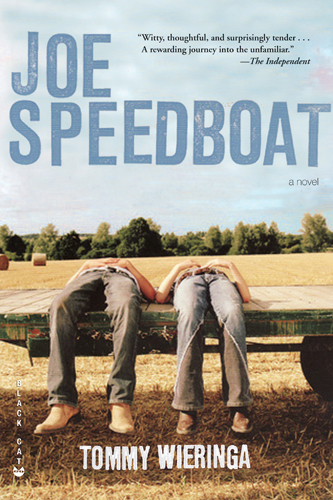 JOE SPEEDBOAT ©2009 by Tommy Wieringa, English translation © 2009 by Sam Garrett, reprinted with the permission of the publisher, Grove Atlantic, Inc.